…She’ll divide it into two true fractures. Well, at least that’s what this mom did! I have always prided myself on running marathon after marathon without a serious injury. Occasionally, I would have something minor – every runner does. But I have never had anything that completely prevented me from running. This all changed in June of this past year. I experienced my first (and hopefully last) serious injury. I have had so many people who seem curious about my injury and subsequent diagnosis that I decided it would be a good idea to write it all down. I am hoping that the knowledge of my experience will, in some way, help someone else. I will start from the beginning. You may want to sit back and relax while you read this. To my dismay, this injury took on a long journey of its own. It was a journey I never wanted to be a part of. But, sometimes in life, we do not have choices. I was on this path, like it or not. In June 2017, I went out for a casual run. Nothing too stressful or long. When I left my neighborhood on that bright, summer morning, I felt better than ever. I had absolutely no premonition of what was to come. About halfway through my 5-mile route, I felt like I had been struck by a bolt of lightning. The sudden, sharp pain was coming from my right, upper inner thigh muscle. I wasn’t sure what was going on. I tried to finish my run, but instead ended up limping home. Ironically, on my way home, I passed Allen (my husband) running in the opposite direction. I explained to him that I must have strained my inner thigh muscle. Neither of us thought it was anything serious, and we continued on our separate ways. I took a couple of days off to let my inner thigh muscle rest and recover. It’s rare that I take any time off (perhaps the underlying cause of my injury); so, it was mentally painful to hold myself back … waiting for this strain to resolve. Little did I know, my rest period from running would end up spanning many more days, actually many more months. After my two-day self-mandated rest period, I tried again. I wasn’t even able to make it a few feet. It felt like my right leg was going to give way, letting my body collapse to the ground – a very strange sensation. As I stated in my book, If You Give a Mom a Marathon, I’m proud of the fact that I was proactive in getting help early on. I know it’s natural for people to think something is minor and that an ache or pain will go away on its own quickly. However, I knew that whatever was going on in my right leg was uncharted waters – it was like nothing I’ve experienced before. I was unsure of how serious the problem was, but I decided it was better to find out rather than waste valuable time trying to self-diagnose my pain. I went to an orthopedist right away, and that decision was one of the best I made in 2017. The orthopedist, a sports medicine specialist, first ordered an X-ray. To my delight, he could see nothing abnormal. I thought I was in the clear! Obviously, there was nothing serious going on if everything looked fine on X-ray. Right? Uh…was I ever wrong! My orthopedist was still suspicious and ordered a MRI. I had never had a MRI in my life, and the thought of this test made me a little nervous. (I am now a pro! I’ve had four MRIs in the past eight months.) What that confirmed, was exactly what my doctor suspected: a stress fracture in the acetabulum of my right hip (basically within my hip socket). This stress fracture extended onto my pelvic bone. My inner thigh was strained. Thankfully, this muscle had served as a warning signal that something had gone seriously wrong within my body. The subsequent eight weeks of my life were tough. I did what my doctor said. I canceled all races during those two months and avoided running. This was the first time in my life I had to cancel my race plans. I lost oodles of dollars in registration fees (Ironman fees are the worst), plane tickets, and other prepaid travel expenses. I kept my spirits up by reminding myself of the greater good I was doing my body. “Long-term dividends” is what my doctor had told me to focus on, and that’s exactly what I did to get me through those two months of misery. When my mandated rest period was over, I presumed I was all better. My stress fracture surely had healed over a two-month period. There was no follow-up MRI scheduled. (They are not exactly inexpensive procedures.) So, I started running again: a slow and gradual build-up: just like the doctor told me. Anyone who knows me, knows “slow” and “gradual” are words that need to be clearly defined. I have a different perception than most when it comes to “slow” and “gradual”. 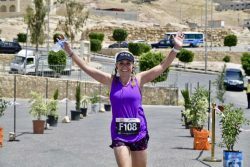 I soon found myself at the starting line of the Petra Desert Marathon in Jordan. You may be thinking …Well, that’s not very logical. I agree, but I as I wrote in the book I was as cautious as I’ve ever been, even considering up until it was time to run whether to do the shorter route instead. It was my slowest race yet, but I was proud of it. Not only was I coming off injury, but the terrain was so difficult and steep that I was forced to walk much of this brutally challenging course. Looking back, maybe I shouldn’t have allowed myself to do the marathon – even though I considered my race pace a walk. The 26.2-mike distance is nothing to be taken lightly, no matter the pace at which it’s tackled. I actually felt pretty good after the Petra Marathon though. I didn’t think I did any more damage to my stress fracture – which should have been healed by that point anyway. Because I had felt so good after the race, I decided to run a local half marathon the very next weekend. Honestly, I think this was the straw that broke the camel’s back. I tried to push myself in the Heartland Half Marathon – an annual Labor Day race in Jasper, Indiana. My thinking was that I needed some speed work (a half marathon) to get back into shape after my eight-week hiatus. When I finished the race, I was awarded not only a disappointing finish time, but a fresh, new pulling sensation in my right inner thigh. Uh oh! Feeling a little guilty and even more nervous about what I had done to my body, I went back to my orthopedist with my tail tucked between my legs. Another MRI showed that my single stress fracture had turned into two true fractures (on two of my pelvic bones). It was around this same time that some of my health care providers agreed that I should go ahead and get a bone density scan. I have no medical background, so I am writing from the perspective of a non-professional. I am only 48. Most women don’t get bone density scans until after age 50, unless the patient is getting fractures in odd places (like pelvic bones). I went into this scan with great confidence, however. Not only did I have age on my side, I have a calcium-heavy diet. My main source of protein is Greek yogurt. Between the yogurt, my daily latte, and my regular exercise regimen, I was sure to come out of the scan with an A+. I thought I had bones of steel. It was one of the biggest shocks of my life when I received the call with the scan’s results. I have osteoporosis. Not even, osteopenia (the middle ground between normal bone density and osteoporosis). Nope. After this diagnosis, I underwent visits to various specialists and had a ton of lab work performed. Why do I have osteoporosis at my age? No one seems to know. Not even the specialists. What my medical team did agree on was that I needed to start an aggressive bone building medication. If I have osteoporosis in my late 40s, what would my untreated bones be like in my late 60s? From what I understand, women continue to lose bone density as they age. Thanks to my new diagnosis, I am now on a $4,000 per month daily, self-injection called Forteo. It is a manufactured parathyroid hormone which cause bones to rebuild. Once my bones have increased in density over a two-year period, I will move to a bisphosphonate: a medication like Boniva or Fosamax which maintains bone density. The silver lining to this story is that my bone density issue was caught early. According to the MRI I had earlier this week, my fractures are all healed. It has been exactly eight months since I was first sidelined with the original stress fracture in my right hip. For someone who enjoys running and racing so much, this has been hard. I won’t lie. It has been miserable. I’m hoping by sharing my story, I will help someone else. I am a proponent of getting aches, pains, and injuries looked at before they become a bigger problem. Think long-term! I remind myself (and want everyone else to know too) that my eight-month inconvenience is small compared to a future with healthy bones. I am sorry to hear about your stress fracture. I had it in both acetabulums at the same time from a fall. I know the feeling. Thank you for sharing. I am sure it will be encouraging to others.